I thought it had to be those pods from the monsters. Not just the flesh. 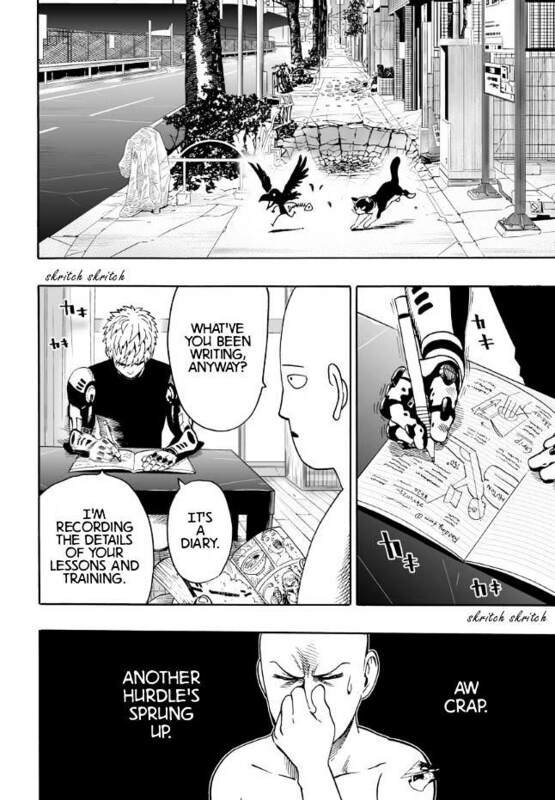 Also Genos is a cyborg and Saitama is... Well, he probably can gulp down a barrel of sulfuric acid and he would be ok. The pods are probably just the concentrated form and accelerate the process; eating the Beast King's flesh was enough to mutate those crows after all. That theory was debunked. 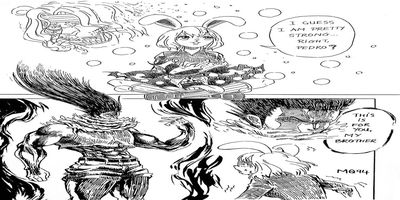 When the crows were being dealt with, Gouketsu explained that the crows were his former disciples who lost their sense of self after eating monster cells. I wish it was the case though. It would've been cool. with crows eating Beast King''s body is just a detail to make fun of Beast King or something. That is, unless I'm forgetting a little panel Murata drew somewhere with three mutated crows. They didn't get mutated though. I hope that top panel is actually Nyan's origin. Were there monster cells in One's version? No, that subplot originated in the redrawn version. Sometimes I wish we'd just followed the webcomic, which is genius on its own. 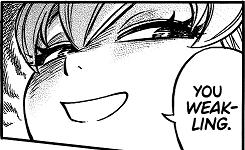 I know ONE is writing the Murata version too.. put man, the pacing was much better in the webcomic, and there weren't all these odd sideplots that lessen Garou's impact as a villain. Garou feels Luffy to me now, i liked him a lot, but plot put him in a position where he can't really demostrate that he can surpass it. Hope Phoenix got a chapter for himself after this. I honestly don't agree with you, i think the manga has been very good until now, i'd say almost perfect, as both for pacing and characters development. Different from the webcomic, yes, but still great. And i love subplots (if they are done well), funny and useful, i like every single character in this manga, so even if we're not focusing solely on Garou i'm still very happy, i'd actually love MORE development and expansion for other characters, also because, remember, the story of Garou is just AN arc, not the main focus of One Punch Man. maybe he'll be an hero in the Neo Heroes. So, now Garou has mastered the Nanto Seiken. He's easily one of my favorite antagonists in this series. Personally, I liked that ONE decided to not to follow through on putting Overgrown Rover out of commission just yet. The SIT panel may be iconic but I always thought it strange that Garou could subdue a Dragon level threat with one punch while Bang and Bomb using their strongest (second strongest?) attack were unable to do anything. So, in my eyes, this is a corrective choice to keep scaling consistent. I actually like that OR had to be encouraged to fight--just a nice little detail. All three are classified as demon-level threats. So, that's neat. The Author is really putting Garou through the wringer, then breaking it off and throwing that wringer with Garou's body halfway in it into the wood chipper, then throwing that wood chipper into a forest fire! Last edited by Sirxxx; April 26th, 2018 at 11:11 AM. Last edited by Ukimix; April 26th, 2018 at 12:05 PM. That wasnt really a spoiler. Garou is meant to fight Saitama and every Saitama fight ends the same way.